While the quadripartite commission gradually broke down, the UCSC entered a period of relatively good fortune. Building Number Two at 3508 Market Street was officially opened in November 1969. The Monell Chemical Senses Center (Building Number Three), which adjoined Number Two at 3500 Market Street, followed suit in April 1971. The UCSC was now also attracting groups from outside the University community to build in the Science Center complex. As early as February 1969, the federal Food and Drug Administration had announced plans to construct a new laboratory at 34th and Market Streets, but this project never moved beyond the planning stage. The same was true for a planned “Science Center Hilton”conference center and hotel complex on 38th Street just south of Market Street, announced in March 1970. Then in February 1971, the U.S. General Services Administration (GSA) announced that it would construct a 15-story office building on the northeast corner of 36th and Market Street for the use of “the four major socially oriented [federal] agencies,”namely the Departments of Housing and Urban Development; Health, Education and Welfare; and Labor; and the Office of Economic Opportunity. This new building was to be called “Gateway Building Number One.” Two months after the GSA, the UCSC announced its own plans for a $20 million low-rise office complex, including laboratories, offices, and a parking garage, on the south side of Market Street between 36th and 37th Streets. Even as it attracted new developers to its complex, the UCSC came near to financial ruin; its net worth was minus $44,136 as of 30 April 1971. As part of its effort to remedy this situation, the Center initiated a campaign to raise money from interested companies and individuals. By January 1972, donors had pledged $307,870 to the Science Center, of which money $129,810 had been paid. The Center’s net worth was minus $16,919 by the end of May 1972. One year later, this figure had grown to plus $129,406, and the UCSC generated its first ever operating surplus in 1973. From this point through to the end of the decade, the Center produced an operating surplus in seven consecutive years. At the same time that it improved its finances, the UCSC sought to modify and clarify its public image. In early 1971, the Center’s president, Dr. Randall Whaley, stated that the mission of the UCSC was “the application of scientific and technical knowledge to help solve the problems of society and to improve the quality of life.” He also stated that one of the Science Center’s major goals was “to stimulate economic growth through the creation of new profit-oriented businesses.” In April 1971, the UCSC Board of Directors even discussed changing the name of the center to the “Delaware Valley Science Center”to suggest a new beginning. In July 1971, the UCSC created UNI-COLL Corporation, a non-profit subsidiary of the Center that would take over the University of Pennsylvania’s computer center at Building Number One (3401 Market Street). Whereas Penn’s computer center had been used primarily for Penn’s own interests, UNI-COLL-with the help of a state of the art (for 1972) IBM 370 model 165 computer-was intended to “serve all institutional users fairly and without bias,”in the words of its executive vice president, Robert Logan. The UCSC also attracted attention in January 1973 when it succeeded in bringing R. Buckminster Fuller, a noted thinker and designer and the inventor of the geodesic dome, to the Center as a “World Fellow in Residence.” Later in the decade, the Science Center sought to change its public image in a more direct way by commissioning several sculptures for permanent display outside its buildings along Market Street. Perhaps the most notable of these sculptures is that of a human face, purchased in 1975, which now adorns the Monell Chemical Senses Center. The UCSC had not yet escaped from controversy, however. The Gateway Center Corporation, the developer hired by the General Services Administration to build the Gateway Building, had backdated the lease for the land in its effort to win the initial development contract. The press, at the time when news about the Watergate scandal was first coming into print, alleged that massive political corruption was also involved, running all the way from the developer’s nephew-the lawyer who signed the lease and held “a 25 per cent interest in Gateway”-to Pennsylvania Republican Hugh Scott, the Senate minority leader and a vocal defender of President Nixon. Though the UCSC was not directly involved in any illegal activity, the scandal surrounding the Gateway Building contract surely did nothing to improve its image. To make matters worse, the RDA threatened not to renew its five-year redevelopment contract with the Science Center, which was set to expire on 26 November 1973. Fortunately for the UCSC, the RDA granted several interim extensions of the contract so that the two parties could continue negotiations. Finally on 29 December 1975, a new five-year contract between the RDA and the UCSC commenced after being approved by the federal Department of Housing and Urban Development (HUD) and Philadelphia’s City Council. In the shadow of all of this bad publicity, the Gateway Building officially opened at 3535 Market Street in the spring of 1973. Brighter times were just over the horizon, however. In February 1974, the Educational Council for Foreign Medical Graduates purchased and moved into one floor of the newly completed five-story office condominium at 3624 Market Street. By April, UNI-COLL had decided to relocate its facilities to another floor of the condominium, and International Utilities Conversion Systems, Incorporated (IUCS), the Kuljian Corporation, and the Foreign Policy Research Institute had announced their intentions to purchase a half-floor each. The UCSC itself eventually moved its headquarters into one floor of the condominium. By May 1978, all of the available space in the building was occupied. The Center also added several new buildings to its complex in this period. In January 1974, the Otis Elevator Company announced that it planned to build its new mid-Atlantic regional headquarters as part of the Science Center, on 3700 Market Street. 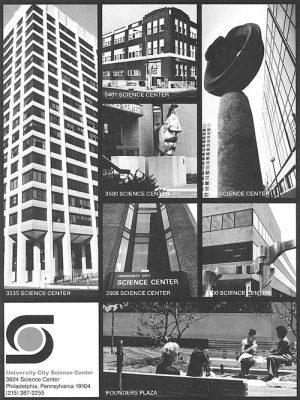 Otis had previously announced that it intended to leave Philadelphia, and a Philadelphia Inquirer editorial declared that the company’s decision to stay “underscores the Science Center’s increasing value to Philadelphia.” Otis moved into the new building in early August 1975. In November 1976, the UCSC dedicated what remained of 37th Street between Market and Ludlow Streets as “Founders Plaza,”a pedestrian walkway, in honor of the Science Center’s founding fathers. 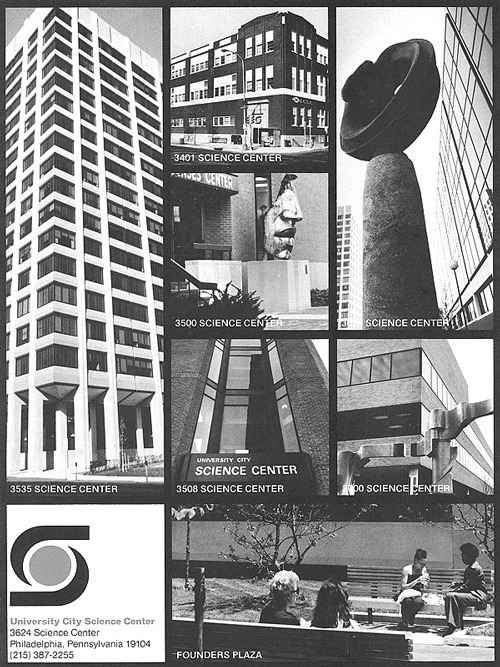 Then in September 1978, the Institute for Scientific Information (ISI) began construction on its new corporate headquarters in the Science Center, at 3501 Market Street. By the late 1970s, many different groups had begun to recognize and applaud the UCSC’s accomplishments. A 1978 Philadelphia Inquirer article praised the Center for having generated “two-dozen”new for-profit businesses from technologies developed in its laboratories and having caused “a dozen”other businesses to remain in Philadelphia. Three years later, the Science Center’s efforts in this vein even merited the attention of a featured article in the prestigious Wall Street Journal. In addition to producing new businesses, the UCSC complex served as a major center of employment in West Philadelphia, providing jobs for approximately 3500 people by 1975. Also beginning to attract attention were the Center’s positive contributions in the fields of criminal justice and law enforcement, health research and data management, and race and gender relations. Following this string of success, the UCSC prepared for its most ambitious project to date. In November 1979, officials announced plans for a $24 million conference center to be called the World Forum for Science and Human Affairs and located on the north side of Market Street between 36th and 37th Streets, across from the office condominium at 3624 Market. The earliest plans for the UCSC had always included an international science conference center, but this idea had not moved beyond the drawing board until the early 1970s. At the 1973 annual meeting of the Boards of Directors of the UCSC and its subsidiary, the Science Institute, Chairman of the Board Paul Cupp stated that the planned Forum for Science and Human Affairs had been selected as the location for special symposia and conferences during Philadelphia’s bicentennial celebration in 1976. The Science Center, however, was unable to obtain the financing necessary to construct the Forum in time for the bicentennial, and it was not until later in the decade that the conference center idea was revived. The new plans for the World Forum met with opposition almost immediately after the Science Center announced them in 1979. Local black residents were wary of the University (with which many still associated the Science Center) reaching out too far into the community, and the general managers of local hotels expressed concern that the Forum would take away some of their business. Then in early 1980, the Rockefeller Center Realty Corporation, which had agreed to develop the conference center, suspended its involvement in the project until a feasibility study could be completed. The project was delayed for over five years, but by late 1985, the UCSC had revived the Forum idea again and found a new developer, Cordish Embry Associates, to start construction for the center. In November 1985, however, the developer sued Penn and the UCSC because it believed that Penn’s planned executive-education center for the Wharton School (due to start construction in early 1986) would take away business that Penn had assured in 1981 would go to the World Forum. The project was delayed indefinitely, and to this day the Science Center does not include a conference center (nor will it likely ever include one, for buildings now occupy most of the UCSC land). Other important developments did take place in the Science Center in the 1980s, however. In early autumn 1980, IBID Associates planned to build 70 federally subsidized townhouses under the name “University City Townhomes”on the land that the Science Center had turned over to Penn’s quadripartite commission ten years earlier. Almost immediately, certain business and other interests in University City tried to block this housing project. Alice Ballard, a local lawyer, stated that the land “is in the middle of the business district, an area that business people think should be developed commercially.” In the end, though, U.S. District Judge Daniel H. Huyett, III ruled not to issue a preliminary injunction to delay the construction, and the housing units were constructed as planned. In the 1980s, new buildings also went up at 3440 Market Street (in 1981), 3550 Market Street (in 1986), and 3600 Market Street (in 1989), and the UCSC added an “annex condominium”to the successful complex at 3624 Market Street in 1985. The Science Center continued to grow in the 1990s, as well. Three more new buildings, bringing the total to thirteen, have been added to the UCSC complex in recent years, at 3615 (the Flex Incubator Building), 3665 (a parking garage), and 3750 Market Street (for the National Board of Medical Examiners).